Veterinarians are truly special people. They work tirelessly to provide medical care to animals—patients that cannot verbally communicate where or how they are hurting. In appreciation, the World Veterinary Association (WVA) has named the last Saturday in April World Veterinary Day to recognize the critical role veterinarians play in protecting animal and human health. This year, World Veterinary Day is on Saturday, April 30, 2016. 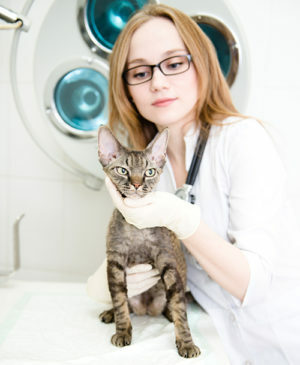 At PetCure Oncology, we work closely with many veterinarians in both clinical and research settings. Whether they are delivering high doses of targeted radiation to treat a brain tumor or running a new clinical study on pet cancer, we are always inspired by the life-saving work veterinarians do every day. Another example of how health care professionals work together under the One Health Initiative could be seen at this year’s Zoobiquity 6 Conference. For example, how does a dog with skin issues affect human medicine? What can we learn about human psychological issues from a feather-plucking parrot? Can a baboon with diabetes teach us anything about human health? Only through teamwork between veterinarians and physicians were we able to bring new treatment options to pets with cancer, and we couldn’t be more grateful. To fulfill our mission to revolutionize cancer care for pets, we believe we need to work with the best minds in veterinary and human medicine. That is one reason why we created a Scientific Advisory Board to guide us in establishing best practices and protocols for treating cancer. In support of this year’s World Veterinary Day, join us in thanking a veterinarian in your life with a card, flowers or even a simple “thank you” for the love they show animals every day. We also hope this year’s One Health theme will inspire you!